Data is shared in numerous ways. MS Office 365 shares data in two ways. One is by folder sharing and the other is by providing delegate access. While folder sharing allows users to access user’s folders, delegate access is totally a separate thing. Folder sharing gives access to view folders but not the authority or rights to act someone else on other person’s behalf to any requests for the meeting or to an email message. However, delegate access allows both of these options, as per the needs of users. Thus, the user can take both the access rights and permissions to reply to meeting requests or email messages from your own side to some other use. The following section assets information on mailbox delegation Office 365 not working. Therefore, delegation full access to Office 365 mailbox is a more commendable one that even lets one share authority rights along with data, with other users. The other users behave similar to the alternate holder of account of your profile, in case you are out of reach. The next section of this article throws lights on relevant facts about delegate access and the cases when Office 365 delegation full access not working error appears. Additional Trick: – Getting hazardous error Office 365 Mailbox delegation full access not working. So first secure you valuable data by using Office 365 Backup Software and then proceed to resolve the issues. In a situation, when you are handling some other person’s account along with your own then, preferably add the other account to your own account to make the access easier and for enhanced manageability. But to do so, it is essential for the mailbox owner to provide you access to handle the account mailbox. To manage this, the mailbox owner should assign you to folder Visible permission on the root folder of Exchange mailbox. Follow the below-written steps. Go to Exchange mailbox root folder and right click on it. Select folder permissions from the given possible options. Select delegate’s name whom you wish to assign permission. Mark the Folder Visible from Others options in Permissions. Click OK button for enabling changes and assigning permission. It is important to consider these points in order to make delegate access work. Give full access permission to the mailbox of the user. For this, use Windows PowerShell in link with O365. As the admin, log into EAC i.e, Exchange Admin Center. Double-click display name after clicking recipients followed by sharing. Now, to add the desired user in Send As, click the Mailbox delegation. Full Access Permission lets users equip the shared mailbox as the main owner whereas, Send As permission let them act as the user and send emails on their behalf. If the issue still exists after assigning Send As rights then, make a shared mailbox, give both permissions (Full Access and Send As) and see the received output. Suppose there is a problem with the mailbox and user is confused on where to start from then, the first thing to do is confirm the settings. See to it that which mailboxes are assigned with delegate mailbox access and what permission is assigned to different users. See whether the permissions are properly assigned or not and if not then, the issue is with MS Outlook. Repair or reconfiguration of the profile is a step that would work in this case. The appearance of any issues in hosted service of Office 365 can mess up the entire scenario. So, it is advised to make use of the first two solutions prior to jumping on profile repairing if Office 365 Mailbox delegation not working. 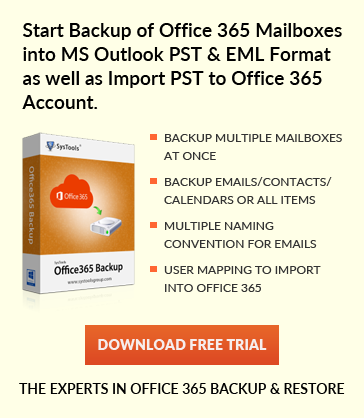 However, if the need exists to access old mailboxes by others or in other cases if a user does not want to assign permissions of mailbox just like that for checking old mailboxes then, it is better to take local backup of Office 365 mailbox. After this, data can be shared to custodians. For an ultimate solution, go through the solution given below. For completely removing this error of Office 365 Mailbox Delegation Full Access Not Working, it is perfect to go for the Professional Solution Office 365 Export Mailbox Backup Tool. The tool very smoothly converts into multiple file format like Outlook PST & EML. The tool also makes sure to make files corruption free and away from all the errors by converting it into healthy MS Outlook files. When the corruption issue generated this tool will help to take backup of all data items. Thus, keeping in mind the error, we have discussed all the possible solutions to solve the error: Office 365 Mailbox Delegation Full Access Not Working. Hopefully, users will be benefited from this write-up and will get to easily fix such types of errors.